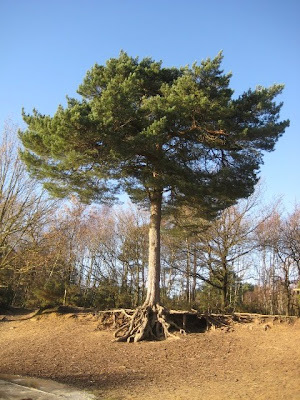 Wissy's blogspot: H G Wells (again) and unusual trees. Last Sunday me and my eldest son Matt went for a lazy five mile walk part of which was over Horsell Common, which if you have read my previous post on H. G. Wells and his book War of the Worlds, was where the Martians first landed with their intention to take over the world. During our walk we came across an area called the sand pit. This was the exact spot depicted by Wells as the first landing area of the Martian spacecraft. 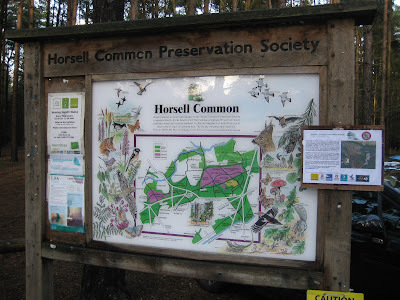 Horsell Common is an amazing place with plenty of different species of trees, scrubland and heath. There is also an abundance of native wildlife. The Sand Pit as depicted in The War of the Worlds. The Sand Pit, Horsell Common. Part of the sandy soil had been washed away and eroded over the years to expose the root system of several of the trees. This did not seem to affect their growth because they all appeared healthy and flourising. They obviously have a tremendous survival instinct. One of the glorious trees. 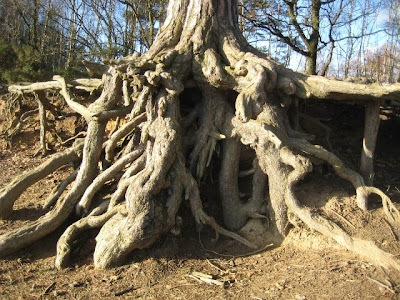 The intricate partly exposed root system. What an interesting tour and wonderful pictures. I love the side by side set on the top. What a pity I did not know about this a year ago! My friends used to live in Guildford and we were there every second weekend. How silly that i never thought to look up the famous site of the Martian landing before.